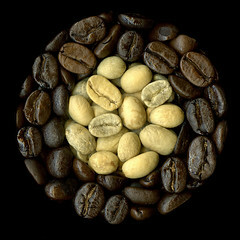 Green coffee beans are the unroasted seeds of the coffee plant. I purchased some last year after reading that they tasted better when immediately roasted. My initial efforts were unimpressive so I put them aside. A month or so ago I started getting emails promoting green coffee extract “as seen on Dr Oz.” Since I frequently write about the virtues of coffee, I clicked on one which had the show embedded. The claims sounded too good to be true, so I started searching PubMed. And there is compelling research,including human research that was done on overweight (but not obese) humans. Roasted coffee is one of the few bitters that Americans regularly consume, one of the highest sources of flavonoids and intake is associated with lower diabetes, Alzheimer’s, Parkinson’s disease, asthma, inflammation as measured by C Reactive Protein (CRP) and a host of other benefits. Epidemiological evidence has shown that a high level of coffee consumption lowers the risk of type 2 diabetes by 67%. Some of the benefit is due to caffeine, some to chlorogenic acids, some to magnesium and other constituents like trigonelline and some to roast products. Decaffeinated coffee also has similar effects. Coffee is a complex aqueous beverage and there is a great risk that assuming the effects of a single constituent like caffeine represent the effects of the whole herb. While widely denounced in health columns until recently ( some people either do not do well on coffee or abuse it) the benefits of coffee have brought an appreciation that the beverage is more than caffeine. Marketing has focused on chlorogenic acid (or more properly chlorogenic acids) as the main source of benefits, although one rat study showed that green coffee extract works better than chlorogenic acids alone. Chlorogenic acids are a group of cinnamic acids found in blueberries, peaches, prunes and bamboo shoots as well as in coffee. They are anti-inflammatory antioxidants that reduce the release of glucose into the bloodstream. Contrary to what you will read on the web, some of the chlorogenic acid survives roasting, albeit in lower and different ratios. Unroasted green beans have chlorogenic acid levels from 61-86 %, while roasted beans have levels of 31-41%. Apparently you can choose your favorite coffee source and still get some benefits for your liver. Dark roasted coffee is higher in a detoxifying compound called N-methylpyridinium (NMP) while light roasted coffee has more detoxifying 5-O-caffeoylquinic acid (CGA) and green coffee is higher in chlorogenic acids. Dark roast coffee is more effective than light roast coffee in reducing body weight, and in restoring red blood cell vitamin E and glutathione concentrations in healthy people. This may because dark roasted coffee beans have less caffeine which stimulates absorption of glucose than medium roast arabica beans and both have less caffeine than robusta beans. (Caffeine may counteract that glucose absorption effect by stimulating metabolism because it alone has a small weight loss effect.) Chlorogenic acids interfere with glucose absorption. But chlorogenic acids are a group and one study indicated that roasting changes the proportion so unroasted and roasted beans will have different effects. Green coffee takes the prize in weight loss. There have been a number of studies showing the benefits of green coffee extract to the liver, fat and glucose metabolism and weight. In one by Shimoda et.al., mice fed green coffee extract lost more fat than those fed caffeine or chlorogenic acid, although all lost weight. The green coffee extract mice lost visceral fat and lowered triglycerides. The researchers concluded that green coffee extract inhibited both fat absorption and fat metabolism in the liver. Other studies concluded that coffee extracts lowered fat and sugar intake with a variety of mechanisms listed below and that the constituents were bioavailable, used in both the small and large intestines. A human study found daily consumption of coffee that was rich in the compounds that are found abundantly in green coffee beans, and also in roasted beans, did indeed result in lower food intake which reduced weight and body fat, along with increased glutathione and Vitamin E.
In one small human study of instant coffee enriched with chlorogenic acid, reductions of 6.9% in glucose absorption were found. The same scientists did a 12-week, placebo-controlled human study with thirty overweight or obese humans who took either the extract or a placebo, dissolved in instant coffee. The chlorogenic acid enhanced extract produced an average 11 pound weight loss with a decrease in glucose absorption and an increase in glucose utilization. The researchers suggested that the lower availability of glucose could cause the body to increase the metabolism of fat reserves, eventually decreasing body fat and BMI. The trial was quite small. 12 people do not make a reliable study. While we know that the sample included overweight men and women who were nondiabetic and without thyroid dysunction, not taking medication affecting blood sugar, we do not know how they were recruited or what their expectation was which could affect placebo effects. While a crossover trial eliminates differences between groups it also sets the expectation that everyone will be given an active ingredient at some point. So it can enhance the placebo response. The group was divided into groups with either the placebo, high dose or low dose first. This is standard for a crossover trial. However the placebo-first group lost weight in the first six week arm. All groups continued to lose weight during the washout periods. That could be explained by a long term effect on the liver, but the placebo-first group shouldn’t have lost weight during the first arm of the study or its initial washout period. There could have been an additional placebo effect from just participating in the trial and recording food eaten on the placebo-first group. Its weight loss was less than the green coffee extract groups. It could be due to drinking a full glass of water before the meal, triggering satiety. Or there may be a problem with accuracy in recording food and exercise. The placebo and high dose were given three times a day and the low dose only twice a day, so participants were not really blinded. However it was a crossover trial so they knew the supplements would change and that defect doesn’t greatly concern me. Food intake was self recorded, but it was done on a daily basis so bias is likely to be small. Since the diet was apparently prescribed, we should have more information on it. Did it lower carbohydrate intake for the participants? We do not know if the study was done on people who already drink coffee. Since the study was done in India where people tend to drink tea, the addition of green coffee extract may be different than to people who already drink coffee. The trial was done on people who were overweight, not obese. Obese people are metabolically different from the merely overweight, and this group has yet to be studied. The trial was only 22 weeks, with supplementation given for 12 weeks. That is probably not enough time for a study dealing with weight and the follow-up was also minimal. My conclusion is that the preponderance of evidence from human and rat studies indicates a likely but not proven effect on weight and perhaps more importantly the liver. While there is much to be studied, the supplement is safe, low in caffeine and seems to be without reported side effects. The participants may well have done other things to supplement its effect- most of us will do that too. It may or may not work as well with the obese or with people who already drink coffee. There is still enough for me to try it along with a low carb diet (since I am more concerned with fat loss than proving the effectiveness of the ingredient) but I am not expecting changes as dramatic as in the trial. Chlorogenic acids have been shown to inhibit the hydrolysis of the enzyme glucose-6-phosphatase irreversibly. This mechanism allows chlorogenic acid to reduce transformation of glycogen into glucose in the liver. It reduces the absorption of new glucose. In addition animal studies have demonstrated chlorogenic acid lessens the hyperglycemic peak , so blood sugar (and blood insulin) will not spike. It inhibits pancreatic lipase which breaks down fats. It interferes with the absorption of glucose molecules in the small intestine and sends them to the distal end of the small intestine where they are less likely to be absorbed. It increases glutathione but not as much as dark roast coffee. It increases insulin sensitivity by increasing signal protein for insulin receptors in the liver. Green coffee extract reduces fatty acid and cholesterol synthesis. Green coffee extract enhances whole-body metabolism, as shown by greater oxygen consumption. It alters body fat distribution. There are two sets of reasonable dosage recommendations. Life Extension recommends green coffee extract standardized to 50% chlorogenic acids at 400 mg three times a day 1/2 hour before meals instead of Dr. Oz’s 800 mg twice a day dose given a half hour before the two largest meals with a glass of water. This is because people with a tendency to hypoglycemia could theoretically go too low and get dizzy or worse. The figure suggested on the Oz show seems to be a compromise of the values in the Indian trial, especially since there wasn’t a huge difference between the lower and higher doses. Doses lower than given in the low dose arm had shown a lesser effect in earlier studies. But there is nothing sacrosanct about the 800 mg figure and you should listen to your body. As long as you purchase it from a reputable company I wouldn’t worry about excipients to keep the extract from flowing freely. That seems to be a marketing gimmick which doesn’t affect absorption appreciably. If there are multiple ingredients- for instance raspberry ketones- check for explicit numbers on each ingredient. Do not accept “1000 mg of a proprietary extract containing green coffee extract and …” because you can’t tell the dosage. There is probably fake green coffee extract out there after the Oz show so open a capsule, looking for a tan powder that tastes quite bitter if the source is questionable. If it tastes like mocha, it is fake. There are two ways to process green coffee yourself, making a brew or making a tincture. They are likely to offer a different balance of constituents since alcohol-soluble constituents are not always water soluble and alkaloids like caffeine may come out more strongly with water. The green coffee in the studies was first ground and then soaked in alcohol which then was evaporated to make a dry extract. If you need the coffee ground I suggest using a commercial grinder in the place where you purchase the beans. I have tried both a Vitamix and a Braun coffee grinder on my green beans, but since the beans are not dried and brittle from roasting, both methods left sizable chunks. Soak the ground coffee in 90 proof alcohol at a 1 g/5ml ratio for two weeks and strain out well, squeezing the bean powder. It is probably easiest just to take the tincture as is, but you will need to experiment with the dosage. Start with 30-60 ml three times a day a half hour before meals. You can also purchase the dry extract wholesale and add a reasonable amount to your coffee, taking it before meals. Or you can do a water extraction by either making a tea or mixing it in with coffee. This may extract different constituents and should be regarded as experimental. Add the green coffee to your usual coffee measurement because it dilutes the taste otherwise. Or put it in your French press and let steep before drinking. It is bitter but lacks the roasted aroma we usually associate with coffee. I like the idea of combining the green coffee extract with dark roast coffee which has been shown to enhance weight loss, increase glutathione and increase vitamin E. The synergistic effects bring us closer to a whole herb beverage. Previous PostWhat’s the Story About Vinegar and Probiotics?Next PostIf you are into herbs, health and diet, why are you fat?